Kitchen Countertops - What to Choose? When you are building a home or remodeling an existing home, you have so much to think about when selecting design options. One of the biggest and most visible are your kitchen countertops! There are so many incredible options available. The trends are always evolving, yet some continue to hold their value, charm, and appeal. Recently, at RDS, we launched our Front Porch Friday video series. Our first video focused on kitchen countertops and we’d like to continue the discussion in this blog. 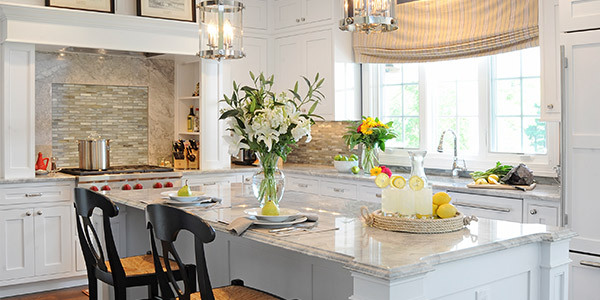 What do you need to know about the current trending countertops and what is making its way onto kitchen counters? Whatever you choose, your kitchen will be a reflection of your dreams for the space. Our designers would be happy to meet with you and help you make the perfect choice for your newly designed kitchen. Do you have more questions about countertop products? Konkus Marble & Granite, one of our trusted suppliers, is here to guide you in your search.